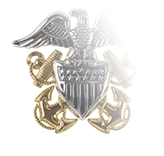 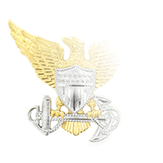 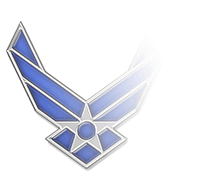 Black or silver shirt studs are a basic component of the male and female versions of the United States Navy’s enlisted Dinner Dress White Jacket / Blue Jacket Uniforms and an optional item for the female Dinner Dress Blue uniform. 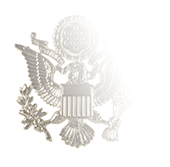 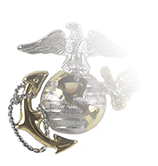 In the U.S. military, the wear of shirt studs is reserved for the most formal uniforms, i.e., the equivalent of what would be worn to a “white tie” civilian affair, and they are always worn with cuff links. 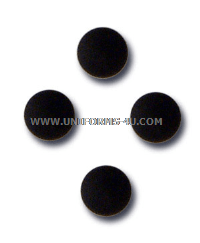 To attach the studs, start from inside the shirt insert the large end through the extra buttonhole beside the button, then use the stud in lieu of the button attached to the shirt—the placket of the shirt will conceal the original button.